Terry & Thweatt, P.C. 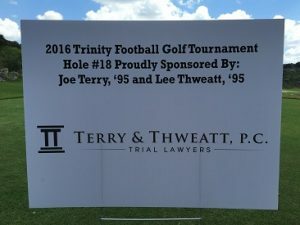 was pleased to be a sponsor again this year for the Trinity University Football Golf Classic held on July 30, 2016 at The Quarry Golf Club in San Antonio, Texas. Proceeds from the golf tournament go purchase equipment and nutritional aides to assist the student-athletes. Terry & Thweatt, P.C. wish Coach Urban and this squad the very best of luck on their 2016 season. Go Tigers!